After visiting an alternative medicine practitioner, she told me about vitamin infusions that he had recommended and then showed me a paper by this practitioner that demonstrated the therapy’s effectiveness. As a scientist myself, I quickly recognised that something was amiss with this paper: the formatting wasn’t up to usual journal standards, the writing was disorganised, and the science itself wasn’t very strong. Looking further into the paper I found it came from a ‘predatory’ journal. Although academics still argue over the exact definition, most would agree that truly predatory journals are ‘fake’ journals that masquerade as legitimate scientific publishing entities. Many are based in India and other Asian locales, but they frequently list US and UK addresses for added authenticity. They also have titles confusingly similar to established, well-regarded journals, a measure, one assumes, designed to dupe a casual reader into believing they are dealing with the real thing. But unlike the legitimate publications they strive to imitate, predatory journals completely fail to uphold the normal standards of scientific and ethical publication. They have little interest in promoting science and they seek only to make money through the publication process. How should a science journal work? In order to understand how predatory journals work, you first need to understand how legitimate journals operate. Typically, researchers write up completed work as a manuscript and submit it to a journal. The journal then scrutinises the manuscript and sends it to other scientists to critically appraise. This process is called ‘peer review’ and the authors are usually asked to provide clarifications or even perform further work to improve the quality of the science. Following peer review, the journal decides if the manuscript is of sufficient quality to publish. If they do publish it, many journals ask for a publication fee. This fee is used to support ‘open access’ publication – the process of making the work publically available for all to access and read. At the end of this process, the final product is hopefully a polished piece of work that contributes to science and our society. Importantly, work in legitimate journals is catalogued (‘indexed’) in databases so that future researchers can find the work easily and in perpetuity. But when work is submitted to predatory journals, very little of the process described above occurs. Many predatory journals will publish a paper as quickly as they can receive their fee. There may be no ‘peer review’ to check the quality of the science. There is often little to no formatting or editing of the writing itself. Even worse, the work is usually not catalogued so that other scientists can find it easily, and some of these publishers are ‘fly-by-night’ operators, meaning that the work subsequently disappears completely. Several sting operations, in which obviously-flawed papers were submitted to predatory journals and accepted, suggest that these entities exist only to turn a profit by collecting publication fees from authors. Are predatory journals really a problem? It’s easy to see how junk science like that encountered by my mother-in-law can be published quickly in predatory journals. Unfortunately, it’s not just junk science that appears in these journals. Our group at the Ottawa Hospital Research Institute recently reviewed close to 2,000 biomedical papers from about 200 journals thought to be predatory. Contrary to what one might assume, authors publishing in these journals mostly came from middle-upper to high income countries, and we even found work submitted from prestigious Ivy-league institutions. Another surprising finding was that some of the work was funded by tax-payer supported agencies. Included in these papers were data from over 2 million patients and 8000 laboratory animals. This represents a colossal waste of human, animal, and material resources. As researchers, we owe it to patients that volunteer to take part in research to make sure that the work is responsibly written up and disseminated in a way that will make it optimally available for others to use and build upon. Concerning animals, it becomes difficult to rationalise and reconcile their use in biomedical research if results are going to be hidden in predatory journals and not contribute positively to knowledge and discovery. It is important to remember that work in predatory journals is effectively ‘lost’ since other researchers will not be able to find it subsequently using relevant search engines or databases. Why are legitimate researchers publishing in these illegitimate sources? This is actually a complex question to which we don’t have definite answers yet, but we can speculate. Many researchers (including myself) receive daily aggressive emails from predatory journals soliciting submissions. Some researchers may be duped by these emails and unknowningly submit their work to a predatory publisher. A member of our group has recently documented experiences of researchers that have unwittingly fallen ‘prey’ to these journals. Most researchers receive little formal training on writing and publishing, so there may be a lack of awareness of the problem. Another group of researchers may be submitting to predatory journals for quick and easy publications in order to ‘pad’ their CVs with extra publications. These extra publications are desirable because promotions committees within academic institutions often use the numbers of papers a researcher has published as an indicator of their success without paying particular regard to where the researcher has published. Irrespective of the exact reasons researchers are publishing in these journals, we know this problem is not going away. A recent audit of publications listed by 46,000 Italian researchers seeking promotion revealed that approximately 5% of the papers were published in predatory journals. Another study estimated that over 400,000 articles were published by over 2,000 predatory journals in 2014. What can the public do to counter the rise of predatory journals? Our research group has recently argued that a response from multiple stakeholders is needed to battle predatory journals. Stakeholders include researchers, institutions, funders of sciences and the public. The first step towards change is awareness of predatory journals and the problems they are creating. 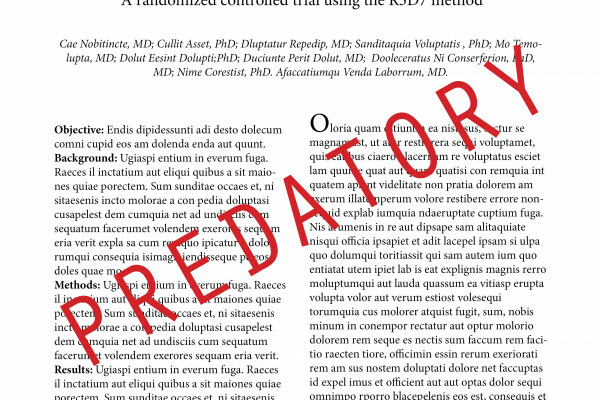 I would encourage interested readers to explore the links accompanying this article to find out more about predatory journals. Next, we believe that society should demand more accountability around scientific publication. The public plays important roles as taxpayers that fund biomedical agencies, as donors to charities that fund science, and as participants of clinical trials and other scientific investigations. Thus, the public holds unique power to cut off the supply of papers and resources to these journals. There has already been some positive movement in this direction since we published our work. The National Institutes of Health, the world’s largest funder of biomedical work, recently issued a statement asking their researchers to take greater care in where they publish. With greater pressure from the public and other stakeholders we hope that statements like these will transform into policies that are enforced. Our group at the Ottawa Hospital Research Institute recently reviewed close to 2 000 biomedical papers from about 200 journals thought to be predatory. A member of our group has recently documented experiences of researchers that have unwittingly fallen ‘prey’ to predatory journals.